As a celebration of LGBT culture and values, the Pride events across the UK are some of the biggest in the world. Aviva are proud sponsors of Pride and, as such, they asked us to help design their presence in London, Norwich, Bristol and York. With a classic double decker bus and #Outsurance as a slogan it was our job to deliver the rainbow, within Aviva guidelines. There were four main elements that needed to be turned around extremely quickly. 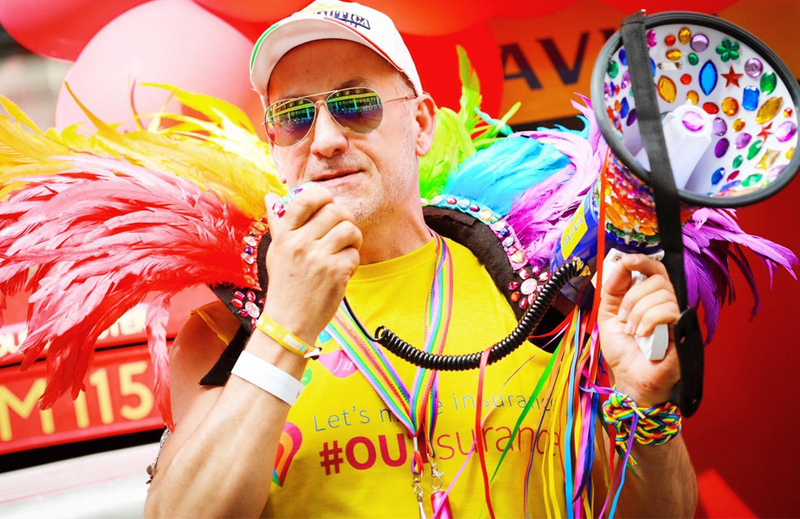 Having agreed the look for the entire event, using the primary Aviva palette and then creating designs that were in line with the pride brand, we began with the T-shirts. The T-shirts that would be worn were loud, proud and Aviva through and through. We went for a full sublimated print meaning the T-Shirts could be delivered using the exact Aviva palette rather than generic colours. We also created placards that could be written on by the attendees bring a personal touch to the event. Finally we branded the bus making the Aviva presence big, bold and extremely impactful. High impact, celebratory and memorable – the branding and design worked excellently, making Aviva very much a part of Pride while retaining their uniquie look and feel. The client was overjoyed with the praise and plaudits they received at the event and internally – definitely proud of their Pride.